Important view of Niagara Falls notable for its realism. Les Chutes du Niagara, Vue Generale; Niagara Falls, General View. A scarce 1852 hand colored aquatint view of Niagara Falls based upon a painting by Hippolyte Victor Valentin Sébron and engraved by Friedrich Salathé. This important view of Niagara Falls is considered among the among the most realistic mid-19th century views of the falls. Sébron visited the falls in person in 1850, when the original paintings must have been made. Both the Horseshoe Falls (Canadian Falls) and the American Falls are depicted under a blue sky. The white spray of the falls and the steam rising from the crashing water is almost opaque. Carriages and boats wait to take tourist for a closer look. At the base of the American Falls, a steam boat appears dangerously close to the fury. The is what appears to be a small whirlpool in the waters of the foreground. Sébron's original painting was well received in the art salons of New York and New Orleans, where it was exhibited at Faivre's Music Store on Royal Street. The popularity of the view was such that it was immediately pick up by Goupil and Company, French publishers who issued the map in New York City. Although titled in both English and French, presumably to appeal to both markets, this view was printed and copyrighted in New York. 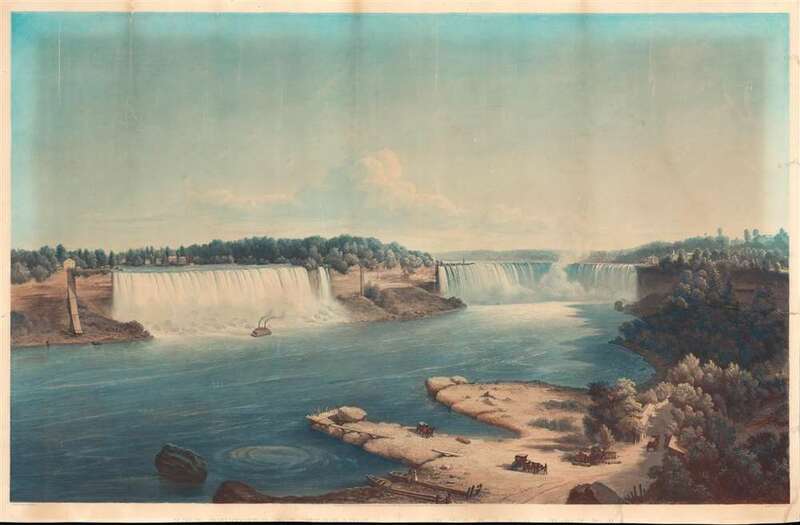 This is one of two views of Niagara Falls issued by Sébron and Salathé, the second being more specifically of the Horseshoe or Canadian Falls. Hippolyte Victor Valentin Sébron (August 21, 1801 - September 1, 1879) was a French painter active throughout Europe, Asia, and the United States in the middle part of the 19th century. Sébron was born in Caudebec-en-Caux in the Seine-Maritime. Sébron is best known for his landscapes and dioramas, but his full corpus includes portraits, architectural views, and interior scenes as well. He was a regular exhibitor at the famed Paris Salon, as well as at the London Royal Bazaar, and at the New York National Academy of Design. Sébron also worked closely with Louis-Jacques-Mandé Daguerre, inventory of the daguerreotype. Working together Sébron and Daguerre created several artworks wherein they employed innovating lighting and painting techniques to produce unique effects that seems to transition between night and day. After a long prosperous career and a life of world travel, Sébron died in Paris in 1879 at the age of 78. Friedrich Salathé (January 11, 1793 - May 12, 1858) was Swiss graphic artist, engraver, draftsman, and aquafortist. Salathé was born in Binningen, Switzerland, the son of the farmer Jospeh Salathé. He apprenticed with the Swiss painter Peter Birmann. He lived for a time in Italy serving on the Pope's Swiss Guard. While in Italy he developed as an artist exhibiting in Rome in 1919. He subsequently returned to Binningen, near Basel, in 1821, taking work with the print sellers Falkeisen and Huber. Reaching the age of 30 in 1823 he relocated, permanently, to Paris, which his work was generally admired. There too he met and married the artist Friederike Neuhaus. Salathé exhibited throughout Paris and two of his aquatints were exhibited at the Paris Salon of 1841. He also worked with Johann Jacob Steinmann producing lithographic and photographic prints. Salathé is best known for his landscapes. Average. Closed tear at center professionally reinforced and repaired. Bottom margin trimmed with some loss to title.